As an independent contractor we can provide the best solution for you without regard to manufacture, we can help you determine the most cost effective energy saving solution to your older HVAC systems. By analyzing your facility equipment performance and your requirements, we can create a plan together that makes good sense. Either repair, modernization, or replacement. This plan would include helping you with your capital budgeting. We provide operational performance testing of chillers and total chiller plant operations. This includes real time energy efficiency (KW/ton) performance analysis. With this combined information we then run computerized performance analysis of the data. This will then allow us to give you a cost/benefit solution maximizing energy efficiency. Review delta T set points and system stability, which can make your chillers and cooling towers use more energy. Review chiller operating design parameters for overall plant requirements. Review chilled water blending issues, which make your chillers use more energy. 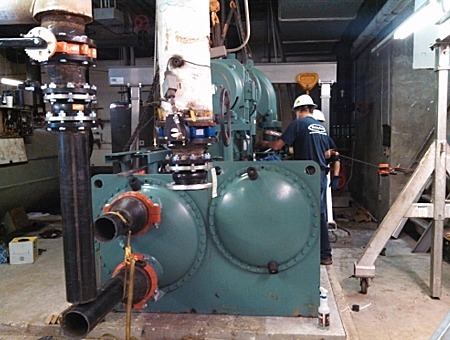 Review valve operation and control in your piping system, Including proper location and purpose. Review pump operation, for balanced system water flows. 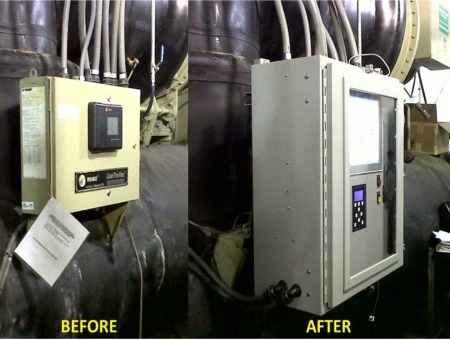 This state of the art package, comprised of a highly efficient variable speed drive coupled with a user friendly, microprocessor based touch screen control panel, is designed for existing chillers regardless of brand/manufacturer or size. Now you can reduce your energy costs by applying the VersaDrive retrofit to your existing chiller. The result – an annual average energy savings of up to 30%. These savings are possible because no constant speed centrifugal chiller can match the performance of the VersaDrive retrofitted machine under real-world operating conditions. Lowest sustainable part load energy consumption. Totally Oil-Free Operation. No oil to degrade system. Very Limited Maintenance. Over 25,000 worldwide. Lowest Noise – 70 dBA. Virtually no vibration.